For the fans of Ron Burgundy, awaiting the December release of Anchorman 2: The Legend Continues, just got a little easier. And a little Scotch-ier. Those of us that share a taste palate with the fictional anchorman are in for a sweet treat. Ben and Jerry’s announced its newest limited batch ice cream flavor, “Scotchy Scotch Scotch”. Sadly, there is NO alcohol content to the ice cream, but if you’re dedicated enough, you can make your own boozey float! The flavor is a creamy concoction of butterscotch ice cream with ribbons of butterscotch swirl. “Scotchy Scotch Scotch” was unveiled at New York City’s Pier 36 among members of the press. The public dissemination was kicked off with a performance by Nutty The Water Skiing Squirrel, made famous by the first Anchorman film. Not only did the scribes get to sample the fresh flavor. It was delivered by a crowd of blazer-wearing Ron Burgundy wannabes climbing out of a Ben and Jerry’s scoop-truck-turned-Channel 4 News-truck. 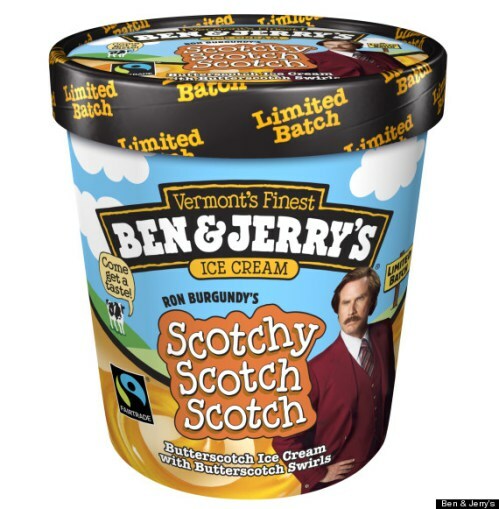 “As a company who believes our fans deserve nothing but the best, we have great respect for Ron Burgundy, who takes the same belief to heart,” said Lisa Sholk, Ben & Jerry’s Marketing Maven, who lead the team on the Scotchy Scotch Scotch flavor project. Adam McKay directs the much anticipated sequel, written by Will Ferrell and McKay. The storyline sees the crew out of the 70’s, out of San Diego, and hoping to stay classy in New York with the nation’s first 24-hour news channel. The side splitting cast returns including Christina Applegate, Steve Carell, Paul Rudd and David Koechner. Maybe trying “Scotchy Scotch Scotch” ice cream will make the 2 month wait, if not more bearable, at least tastier. Enjoy The New Hilarious ‘Anchorman 2’ Trailer!!! This entry was posted on Thursday, October 24th, 2013 at 10:02 am	and is filed under Film, News. You can follow any responses to this entry through the RSS 2.0 feed. You can skip to the end and leave a response. Pinging is currently not allowed. « Paul Feig Is Set For the ‘Peanuts’ Film!!! I'm gonna break high and right, see if he's really alone.